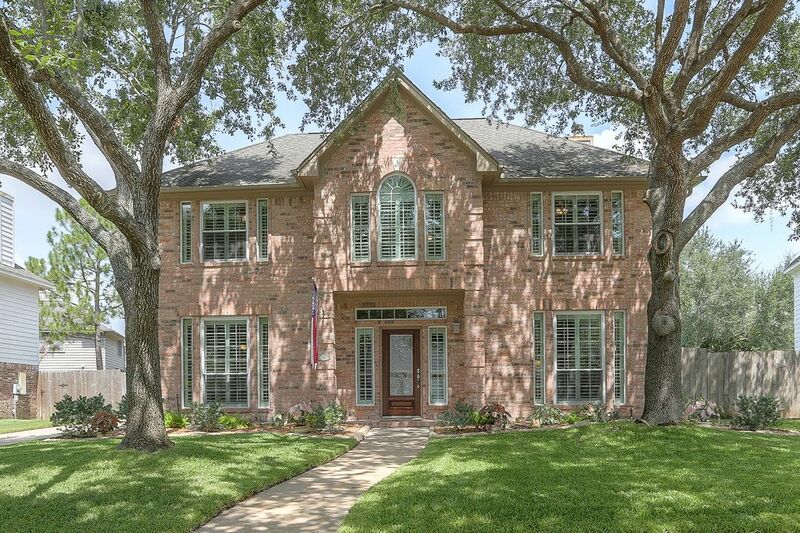 2707 Village Dale Avenue, Houston, TX 77059 | Martha Turner Sotheby's International Realty, Inc.
Nestled among towering mature trees, this beautiful traditional home boasts a handsome façade accentuated by timeless executive brick and leaded glass-clad front door. Framed by dual side lights, the newly upgraded leaded glass front door and dramatic clerestory windows impart an abundance of natural light which highlights the beauty of the impressive foyer. Anchored by a staircase embellished by iron ballusters, the foyer provides seamless flow to the family room, study and dining room. 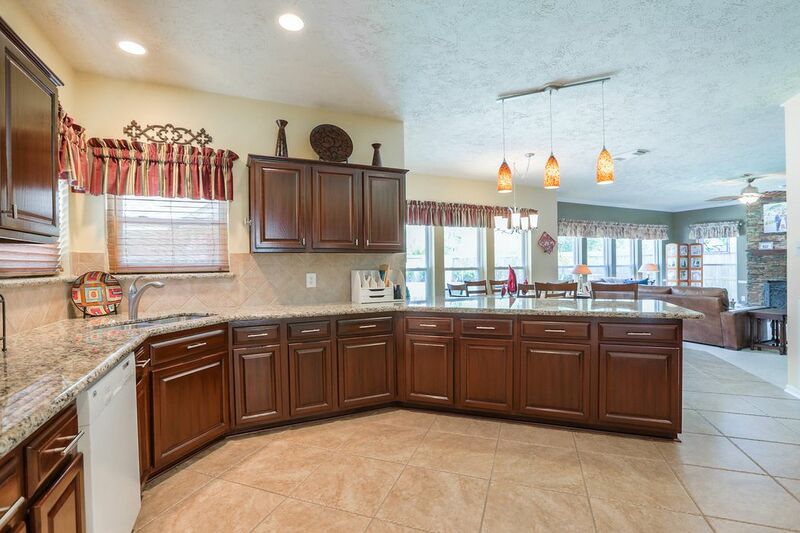 Interconnecting with the family room, the kitchen has a feeling of pronounced openness as it provides the perfect backdrop for entertainment of family and friends. 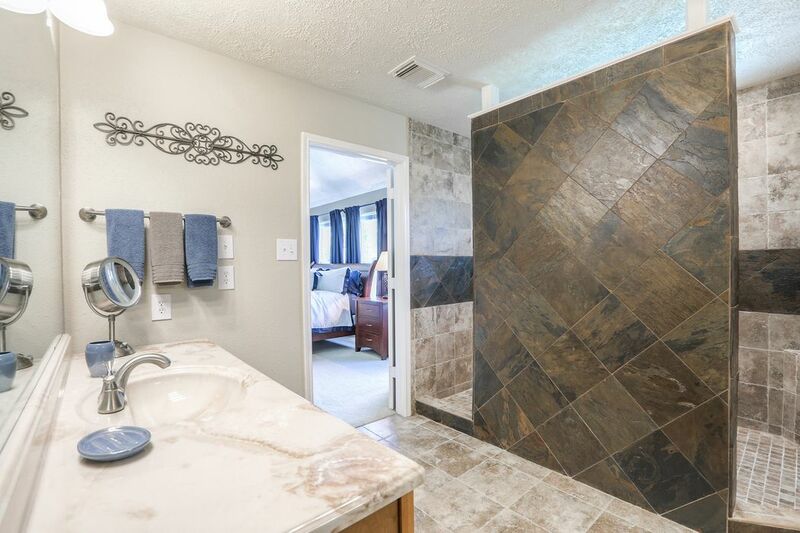 Dramatic tile wall adds interest to the lavish master bath. What better way of enjoying a relaxed lifestyle than gathering at the pool for time of fellowship with friends and family. Plantation shutter-dressed windows provide serene vistas of the front lawn in the elegant dining room where crown molding, wainscoting and decorative chandelier add to its appeal. 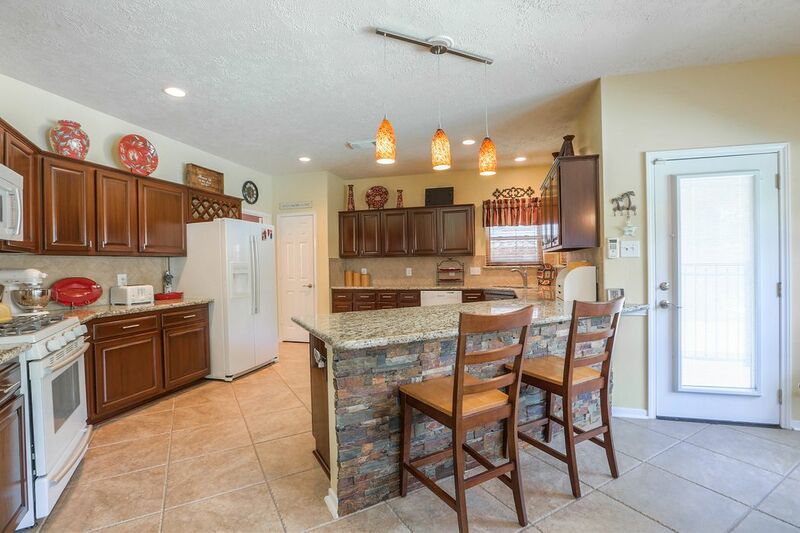 The cook’s kitchen boasts granite counter tops, rich cabinetry, professional appliances, recessed lighting and tile flooring. A trio of custom lighting fixtures suspends over the kitchen bar that becomes a decorative showpiece with its stacked stone. Walls of windows bring the outdoors in as they allow the kitchen and family room to be engulfed in floods of natural light imparting a feeling of continuity between the two rooms. 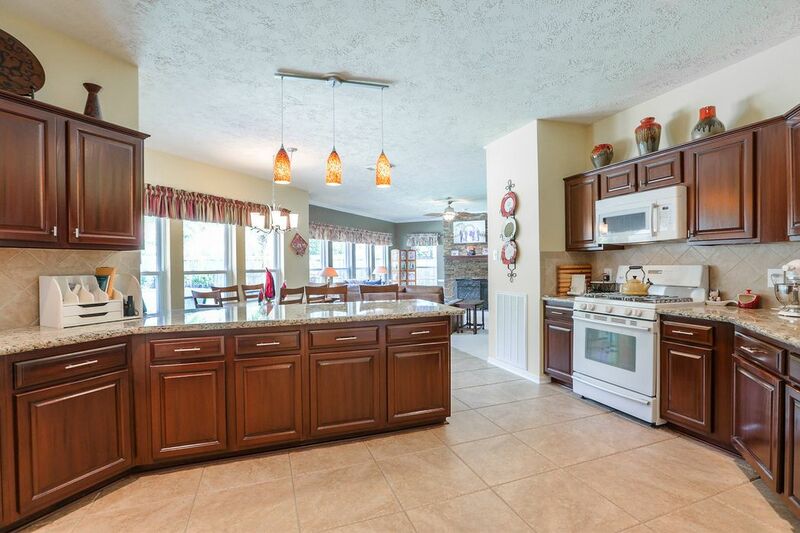 The invitingly casual breakfast area is perfectly positioned to unite with the kitchen, outdoors and family room. 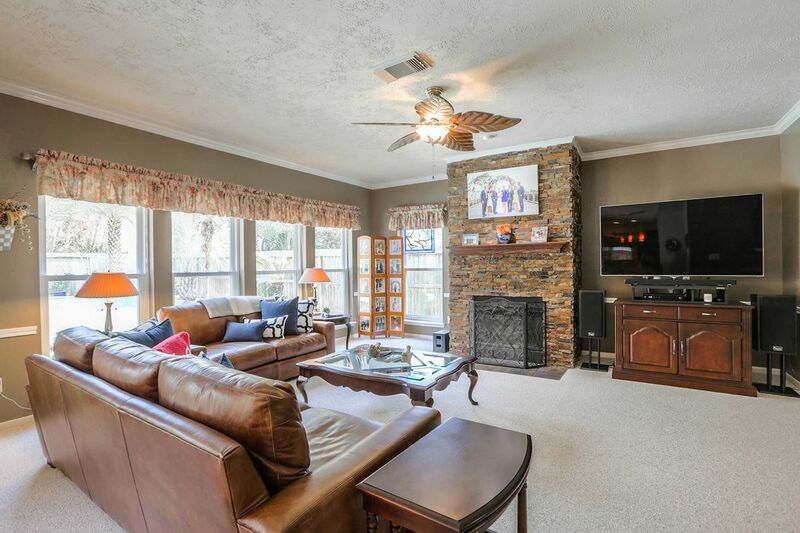 Banks of windows engulf the warm family room where a brick surround fireplace and entertainment center serve as its focal point. 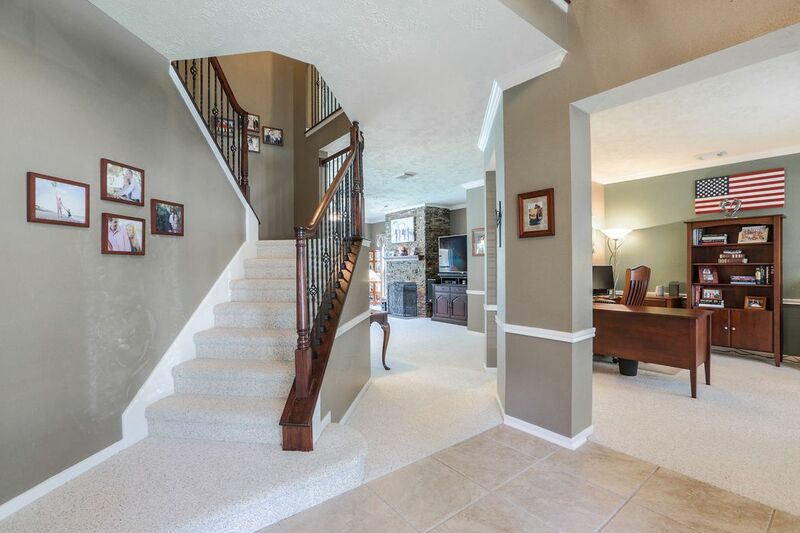 This view showcases the flow between the family room, kitchen and foyer. 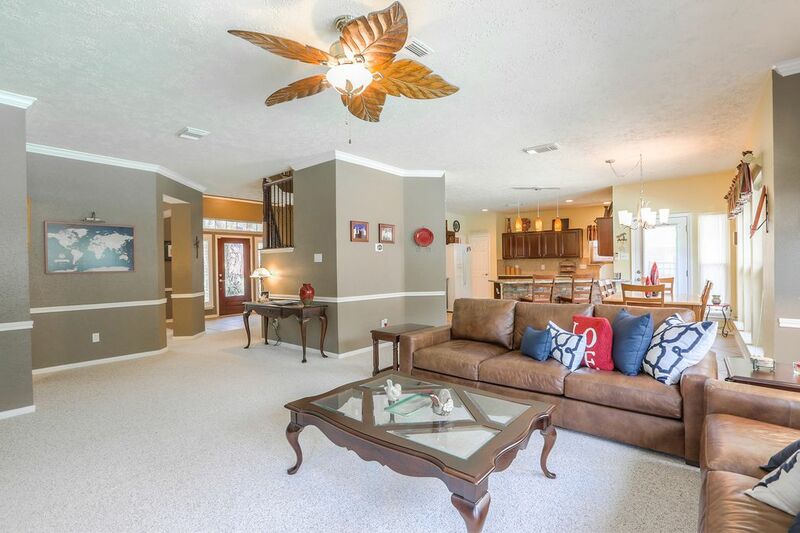 Note ceiling fan with light kit, crown molding and wainscot. Powder room conveniently located off the entry. 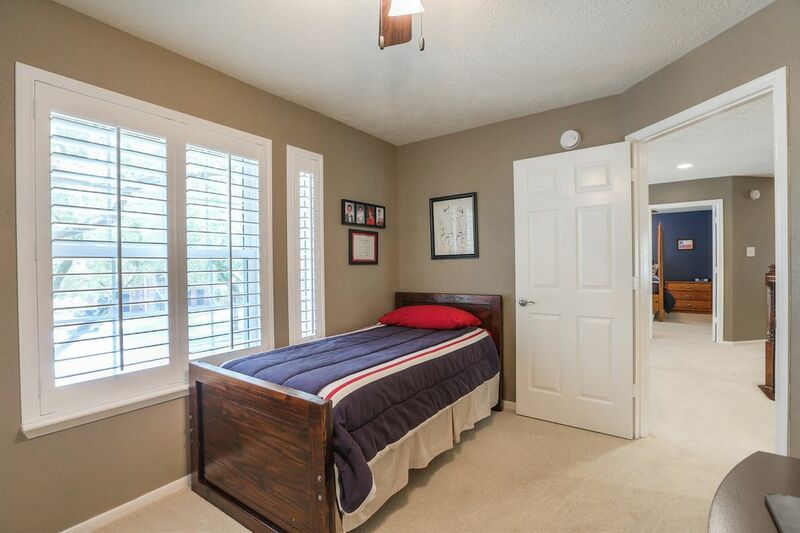 Wrap around windows give an illusion of additional space to the master bedroom graced by coffered ceiling, lush carpet and ceiling fan with light fixture. 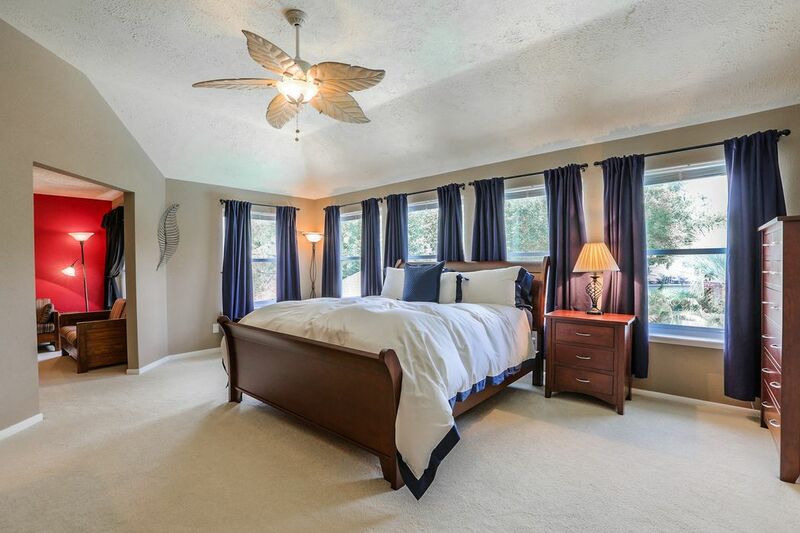 Custom draperies dress the wall of windows that allow floods of natural light to engulf the master bedroom. 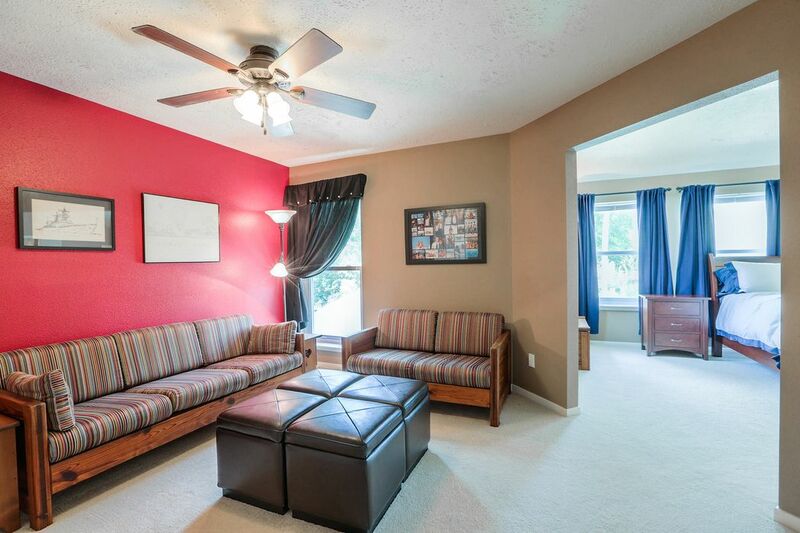 Delightful sitting room nestled against expansive master bedroom adds an element of relaxation and serenity. 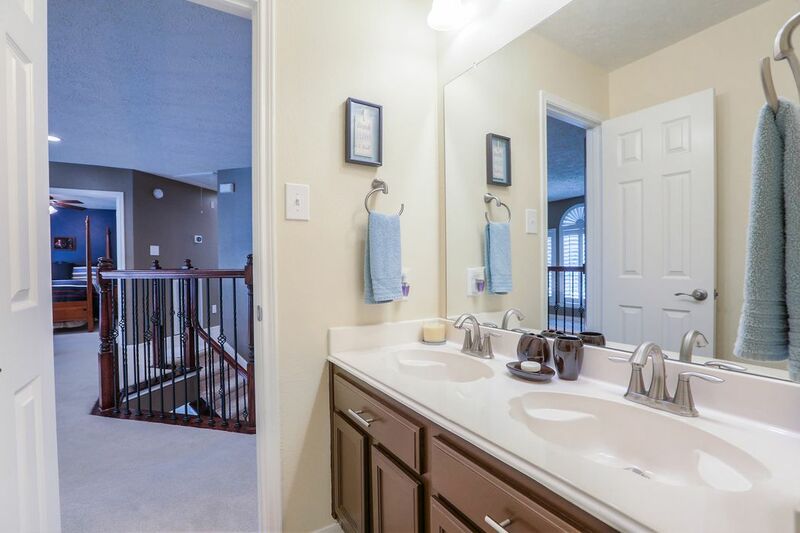 The master bath is light and bright and has custom cabinetry, designer light fixtures, dual vanities and tile flooring. 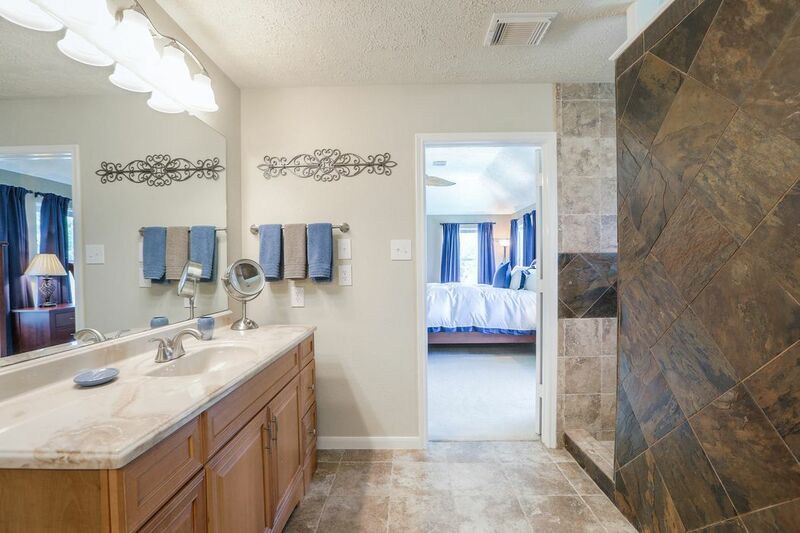 Striking oversized decorative tile introduces the master bathroom. 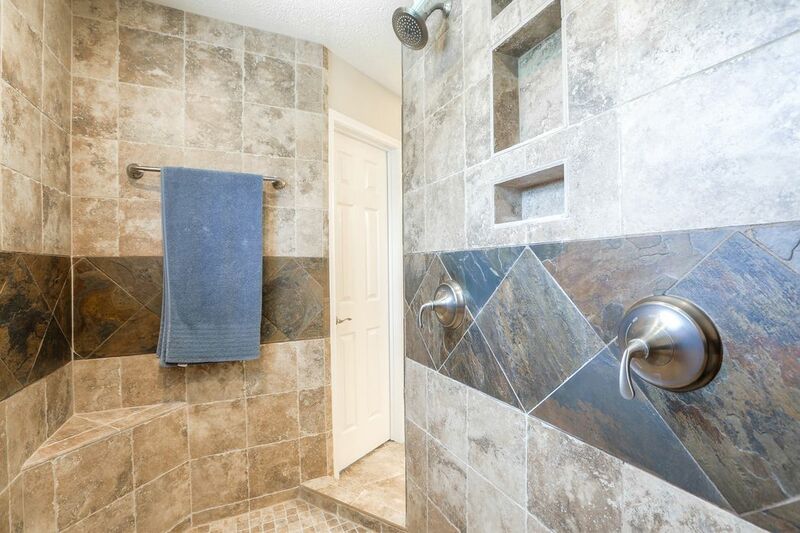 A diagonal tile border embellishes the two person walk-in wall shower. Note custom shampoo and soap insets. 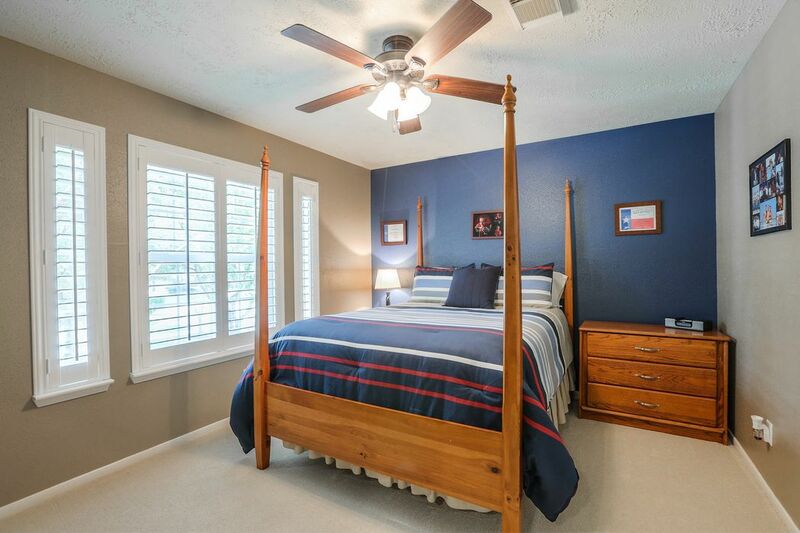 Pretty windows dressed in plantation shutters, ceiling fan with light kit and large closet compliment this charming bedroom. Walls cloaked in warm khaki adds warmth to the sun-lit bedroom. 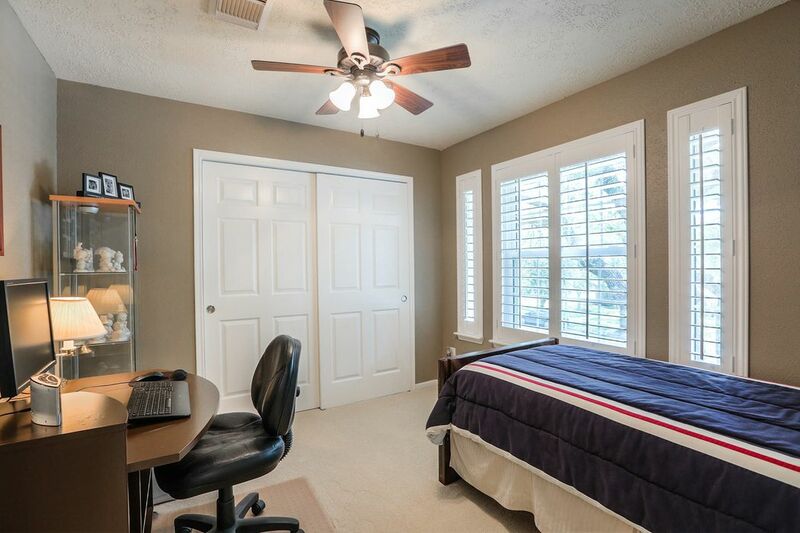 Plantation shutter-dressed windows yield inviting treetop views in this well- appointed secondary bedroom. 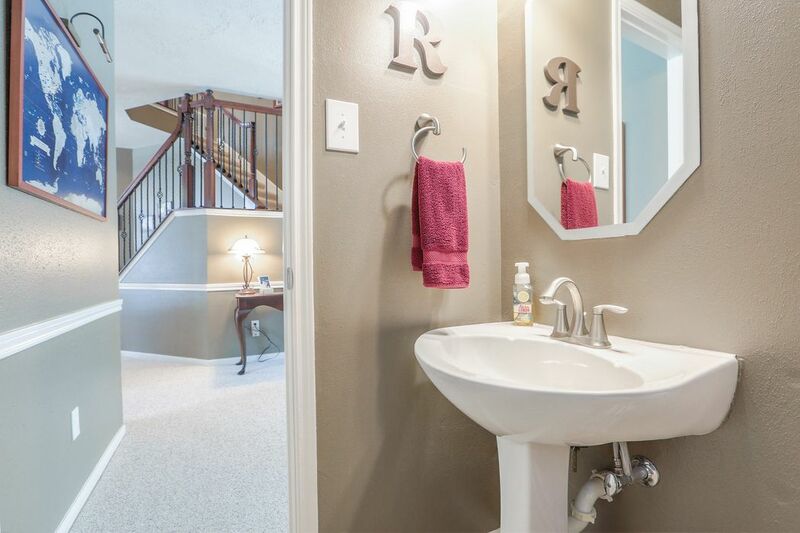 Secondary bath located off upstairs landing. Another view of the expansive, inviting pool. 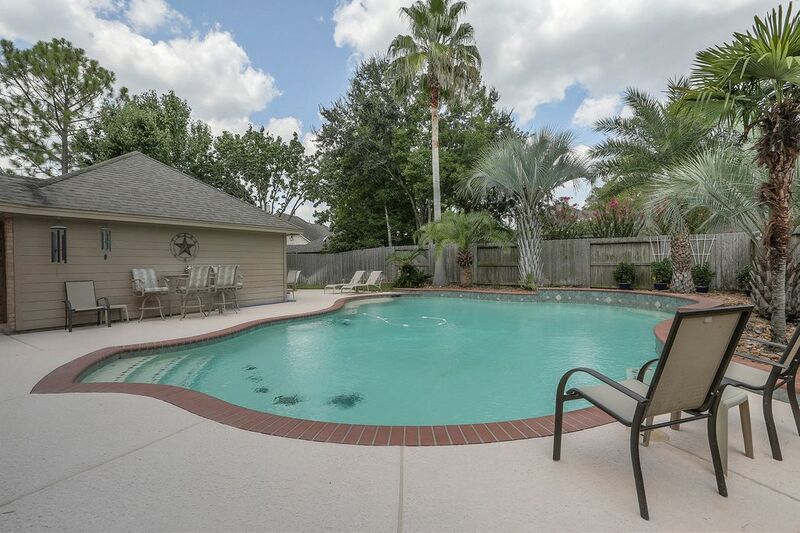 Living at 2707 Village Dale offers a tremendous advantage of having a glistening pool. 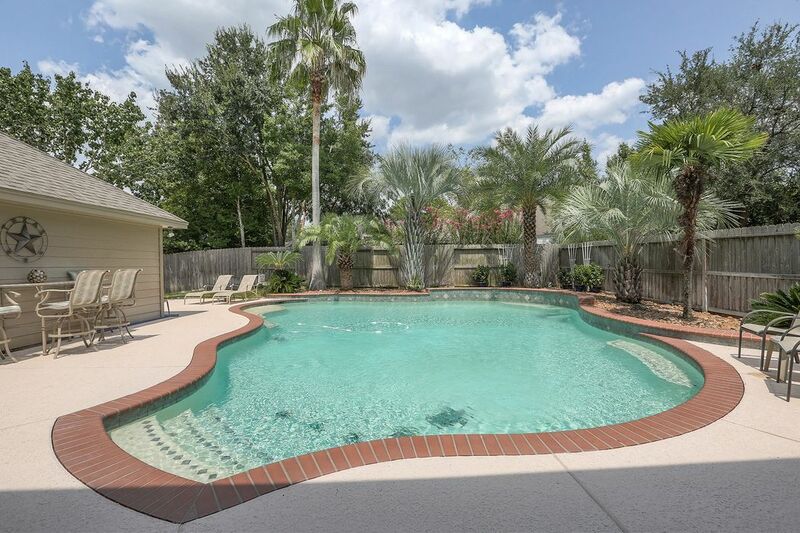 The pool will glisten in the sunlight as you gaze upon the back of the home. 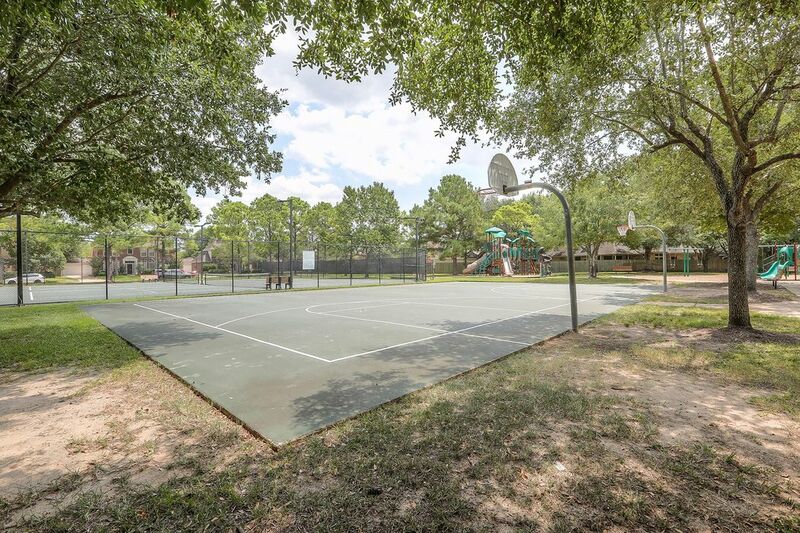 Great opportunities for recreation…basketball or a game of tennis. Very convenient to have a fabulous playground close by. 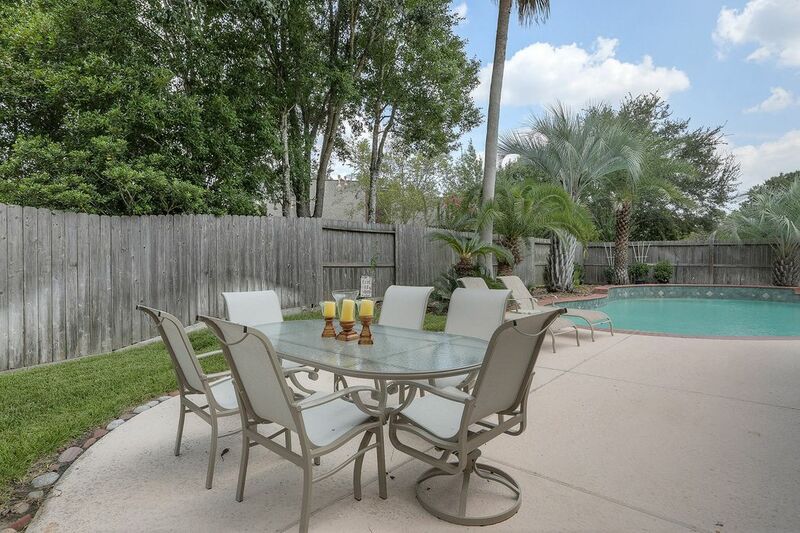 $334,500 4 Bedrooms2 Full / 1 Partial Baths2,852 sq. 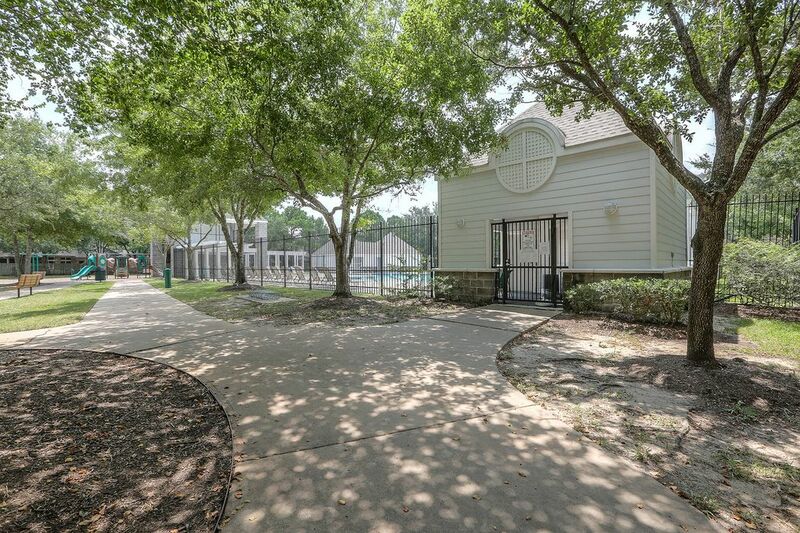 ft.
Nestled among towering mature trees, this beautiful traditional home offers an opportunity to live in the wonderful Clear Creek community and be close to the neighborhood park, pool and tennis court. 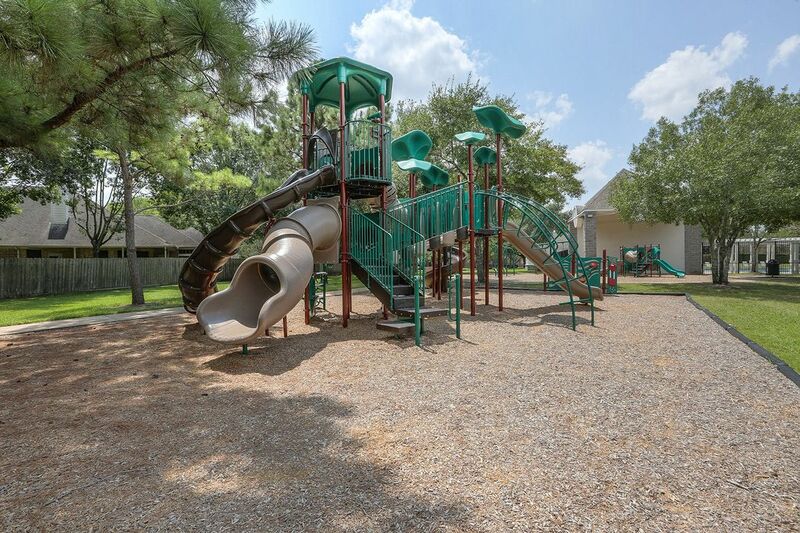 Johnson Space Center is only minutes away while the Clear Creek Independent School District anchors the neighborhood boasting award winning North Pointe Elementary school positioned close by. 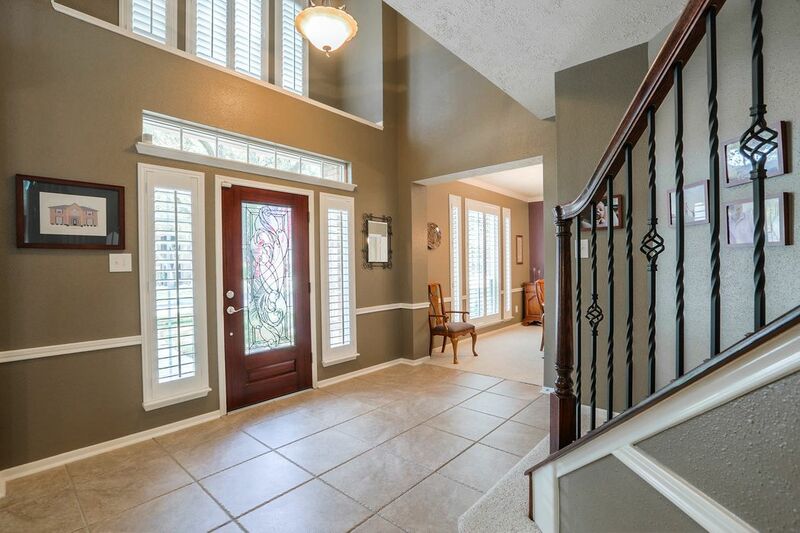 The handsome façade accentuated by timeless executive brick and leaded glass clad front door, serves as a warm welcome for guests as they enter the striking 2-story foyer. Clerestory windows impart an abundance of natural light showcasing the staircase and the inviting foyer. 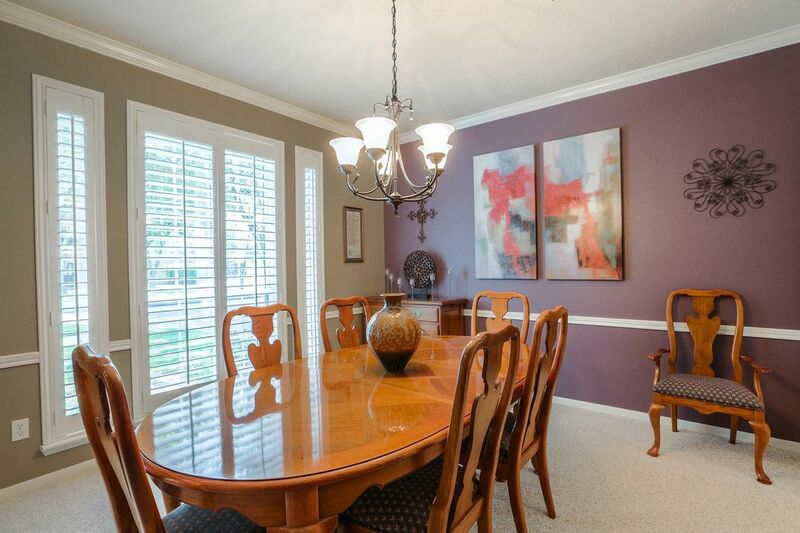 Plantation shutter dressed windows provide serene vistas of the front lawn in the elegant dining room where crown molding, wainscoting and decorative chandelier add to its appeal. Banks of windows engulf the warm family room where a brick surround fireplace serves as its focal point. 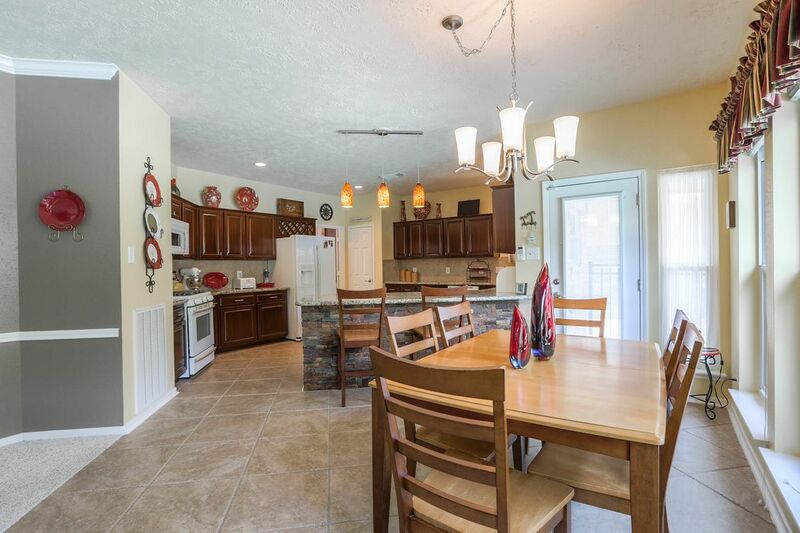 Interconnected with the family room, the spacious cook’s kitchen features granite countertops, tile flooring, rich cabinetry and professional appliances. 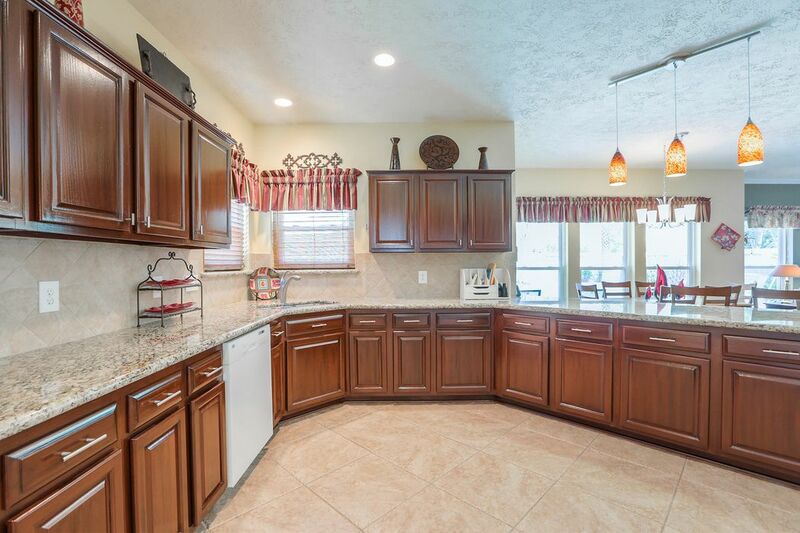 Stacked stone adds a decorative touch to the breakfast bar that is perfect for gatherings. 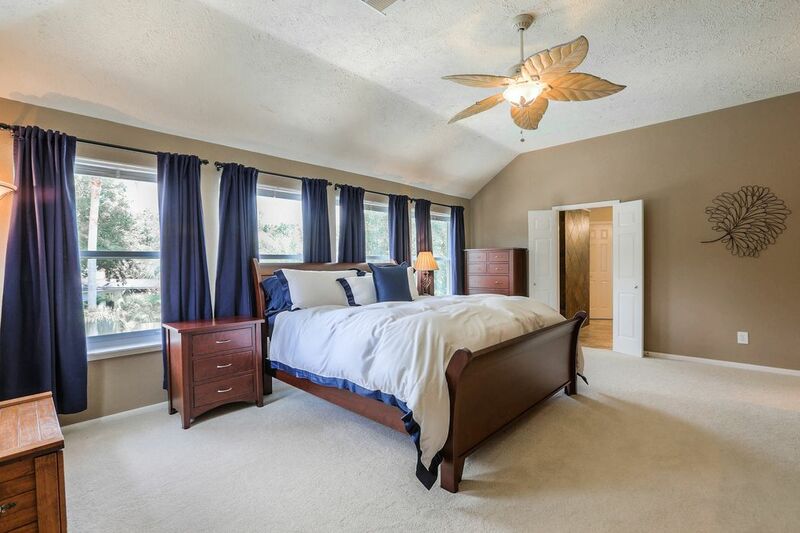 Natural light floods into the expansive master bedroom thanks to walls-of-windows. The room is replete with a coffered ceiling and adjoining sitting room. 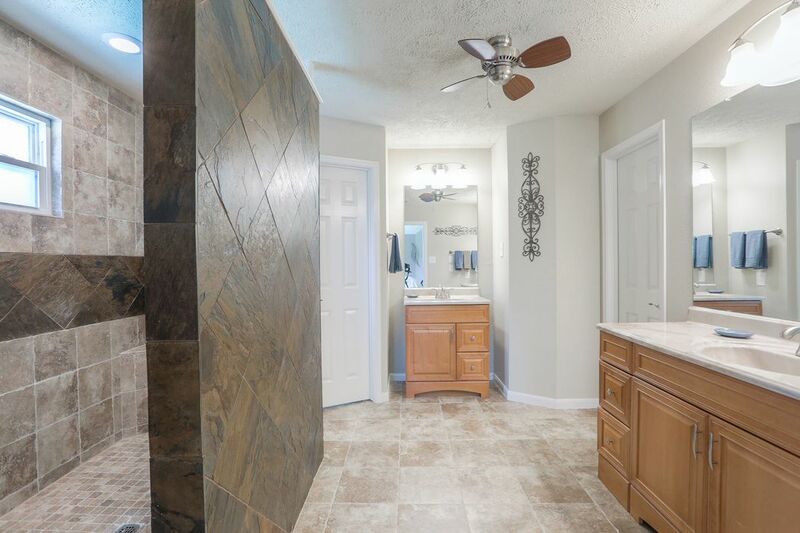 Embellished by oversize decorative tile, the master bath has a walk-in wall shower. 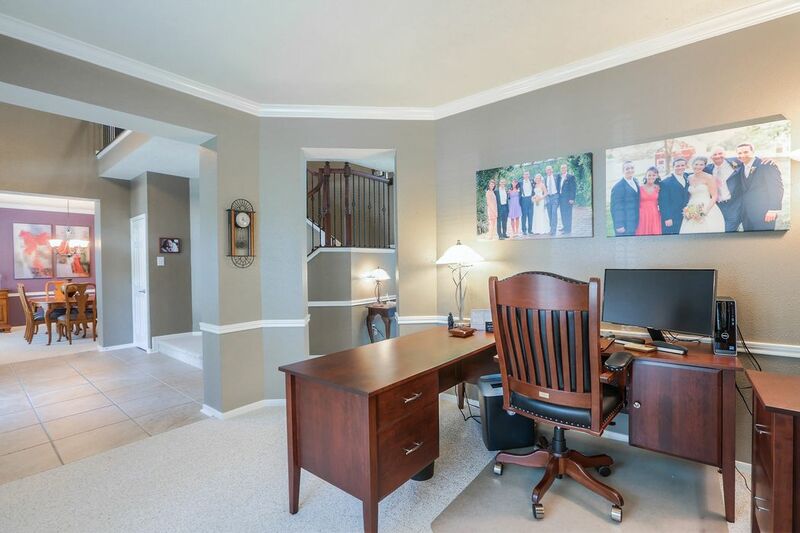 Completing the upstairs are 3 additional well-appointed bedrooms and 2 baths. 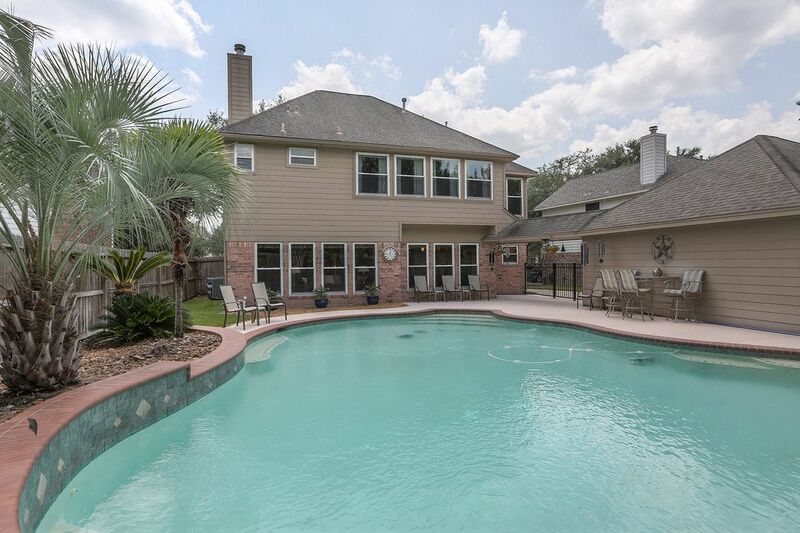 The home had a 30-year roof installed in 2008, all new HVAC units in 2012, new water heater in 2016, updated ceiling fans throughout, HARDIEPLANK siding, 31,400 gallon play pool and Simonton double pane windows. Home did not flood during Harvey.